Is There a Right Time to Bloom? It was early July when my husband and I purchased something unusual from a yard sale. As we perused the offerings, we saw a shelf with several plants. One was a Christmas Cactus with a single pink blossom. This popular house plant generally flowers in the winter. The bloom caught my attention and we decided to purchase the plant. When we paid for it we were told the plant must be confused and think it was Christmas. My husband joked that it was Christmas in July. I thought back to a Christmas Cactus I’d had many years ago. In order to produce flowers at the right time of the year, I was told to put the plant in a cool, dark spot and ignore it. A few weeks before I wanted it to blossom, it should be brought into the light and feed and watered. When I went to retrieve it I discovered that the poor plant had shriveled up and died. I didn’t want this one to suffer the same fate so searched the internet to learn how to properly care for my new plant. As I often do, I related this experience to life. If I distance myself from Jesus, the light of the world, my life will be in a dark place. When my spiritual life withers I am not able live a productive life. It is by trusting in Jesus that the Holy Spirit is able to make my life will blossom with love, peace, patience, kindness, goodness and faithfulness. We had a good laugh over her misunderstanding of the words. I wondered how someone could eat their courage away. I pictured a big bowl of alphabet pasta and the words courage and brave being scooped up on the spoon ready to be consumed. The more I think about it, the more I realize that I have probably eaten my courage away. Every time I have the opportunity to be brave and don’t take it, I eat away at my courage. Small bites over time can leave me with very little remaining. Being brave doesn’t have to involve big actions. It just requires a simple step in faith and trust. The willingness to take chances is courageous. Even what I perceive as failures can be stepping stones to future success. I read some quotes that illustrate this for me. The first one is from Julia Soul . “If you are never scared, embarrassed or hurt, it means you never take chances.” Bob Perks said, “Expect that if you want to accomplish big things you’ll experience big failures along the way. You’ll know then that you’re on the right path.” These quotes remind me that I can be brave even when fearful. From an unknown author came, “Your current safe boundaries were once unknown frontiers.” This rings true for me. I am comfortable doing things today that I never would have imagined I could do. There are many times in the Bible where God has done great things through those that relied on the assurance that he would see them through. When I trust him to work all things for good, my courage will once again grow. If I have any doubts I need only look at his quotes from the Bible. The wording on labels can sometimes evoke a meaning for me that I’m fairly sure is not what the manufacturer had in mind. My amusement faded when I realized that I have often qualified as one of those people. Too many things to do and not enough time to accomplish everything can put me under pressure. This is usually something I’ve brought upon myself, either by taking on more than I should or procrastinating until I’m short on time. Even so, the pressure builds and those around me need a warning to stay clear, lest I explode. This doesn’t happen as frequently as it did in the past. I am learning to bring my plans to Jesus. When I ask for his direction on what to say, “yes” or “no” to, my life runs much smoother. By making time with him the number one priority on my list I am better equipped to handle whatever comes my way. His guidance will enable me to keep the pressure under control. There is no better way to start my day than letting Jesus handle it with his loving care. There are many variations of roots. Some are exposed while others are well hidden. Near the end of a walk I encountered an area where several trees had roots exposed. They seemed to reach from one to the next as if providing stepping stones. My husband was not surprise when I asked him to stop so I could take a picture. These roots seemed to have a greater meaning to impart. I carried on, knowing the meaning would be revealed a I prayed for clarity. Thoughts that came to mind were of my life being rooted in Jesus. When my roots run deep, I can stand strong and tall. If none of these roots are visible, how will others know that it is Jesus that provides the foundation of my life? As well as reaching deep, some of my roots need to be exposed for all to see. They can form the stepping stones that will point others to Jesus. This will happen more readily when I allow myself to be open and vulnerable rather than pretending everything is perfect. Some campgrounds have interesting traditions. The one we stay in holds a Canada Day parade the Saturday before July 1st. Family friendly is a good description of this event. Everyone was encouraged to decorate their sites. Canadian flags and banners were hung. Red and white in the form of streamers and balloons were seen in abundance. 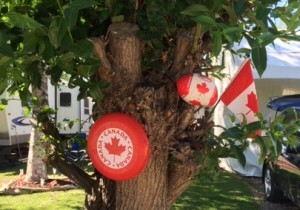 We even hung a Canadian flag Frisbee in our tree! 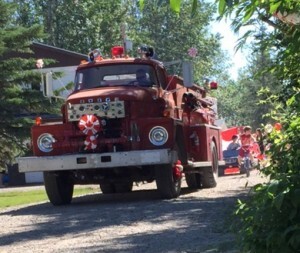 A big red fire truck decorated with Canadian flags led the parade. Behind the truck was where the real fun started. Children rode decorated bicycles; drove battery operated cars and waved flags as they walked the parade route through the campground. Parents walked along with them. Those deciding not to enter the parade sat in lawn chairs to watch the procession. The lucky ones were able to gather some of the candy that was tossed out to the spectators. In a matter of minutes the parade had passed. What lingered was the joy of seeing families participating together in this event. If this simple celebration could foster such a spirit of co-operation and joy, imagine a world where families, friends and neighbours joined together to celebrate and share the love of Jesus. That kind of contagious joy could change the world!